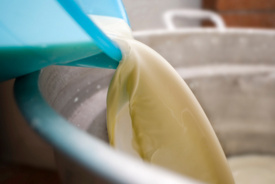 Legal news for Pennsylvania product liability attorneys – A man was diagnosed with Guillain-Barré Syndrome days after drinking raw milk from a New Castle dairy farm. Family of man paralyzed from Campylobacter infection blames raw milk consumption. Mars, PA (www.NewYorkInjuryNews.com) – A man is on life support at UPMC Presbyterian Hospital and his family is alleging it is because he consumed raw milk from the McGinnis Sisters Special Foods Store, as reported by www.WPXI.com. James Orchard, 67, of Mars, was diagnosed with Guillain-Barré syndrome (GBS) several days after he and his family drank raw milk that was produced by Dean Farms doing business as Pasture Maid, LLC. The creamery is located in New Castle and has since lost its license to sell raw milk. Guillain-Barré Syndrome is a disorder that causes the body’s immune system to attack part of the peripheral nervous system. While Orchard maintains minimal head and eye movement, he is otherwise completely paralyzed. Many people who develop this syndrome initially had a Campylobacter infection. Milk from the bottles produced by Dean Farms, purchased at the McGinnis Sisters store, tested positive for the bacteria. Human ingestion of Campylobacter bacteria causes diarrhea, nausea, vomiting, abdominal pain, headache and muscle pain. Symptoms will typically appear two to five days after exposure. Most cases of the infection are mild, but Campylobacter jejunti infection, or campylobacteriosis, can be severe and life-threatening. It can cause appendicitis, infect other organs or even enter the blood stream. An estimated one in 1,000 cases of Campylobacter infection results in death. As was reported on April 9, 2010 on www.NewYorkInjuryNews.com, the farm lost its license on April 8 after several complaints of sickness from drinking raw milk arose. Doctors told reporters that Orchard’s condition is treatable. The amount of time it will take for Orchard to fully recover from his injuries is unknown though. An agriculture department spokesperson told reporters there are 129 production permits for raw milk within the state of Pennsylvania. Legal News Reporter: Tara Monks – Legal news for Pennsylvania product liability lawyers.